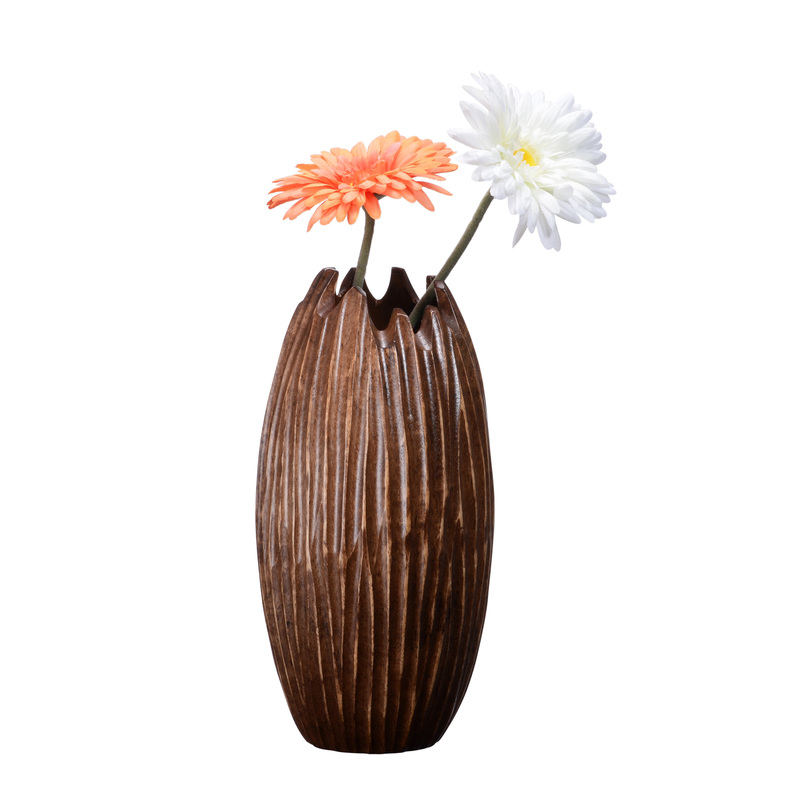 The irregular concave edges of the Villacera Handmade 12" Tall Round Mango Wood Brown Tulip Vase puts a contemporary spin on a classic stand-out accent to your home decor. 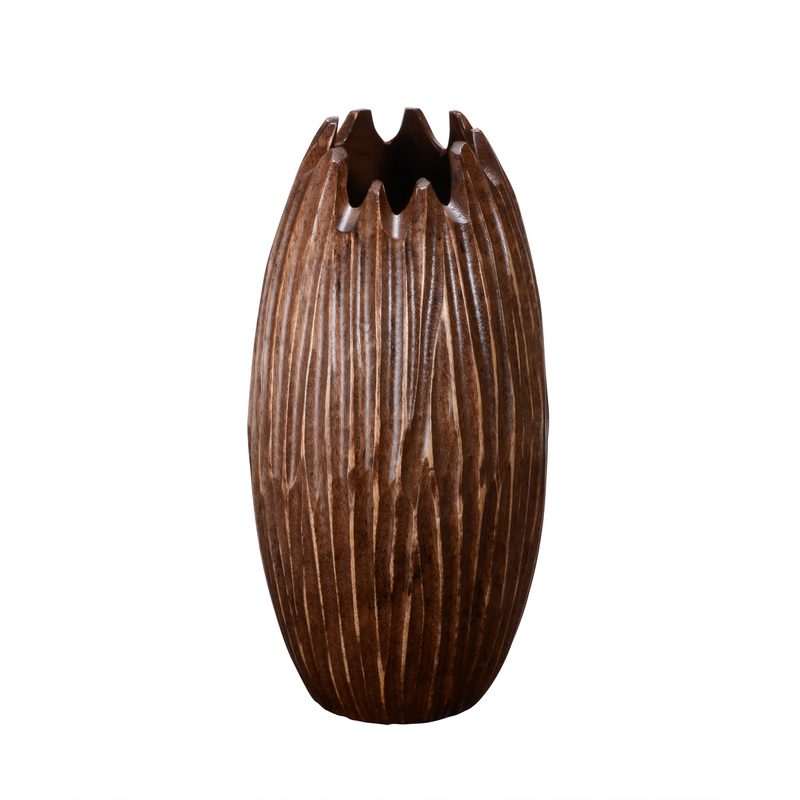 Standing 12-inches tall, its smooth round profile is interrupted by sets of hand-carved waving lines that expose the true texture of the mango wood, creating a charming and exotic statement in any living space. Fill with your favorite branches, silk plants or artificial flowers and place on a side table, atop a dresser or use as an accent piece in a bathroom. 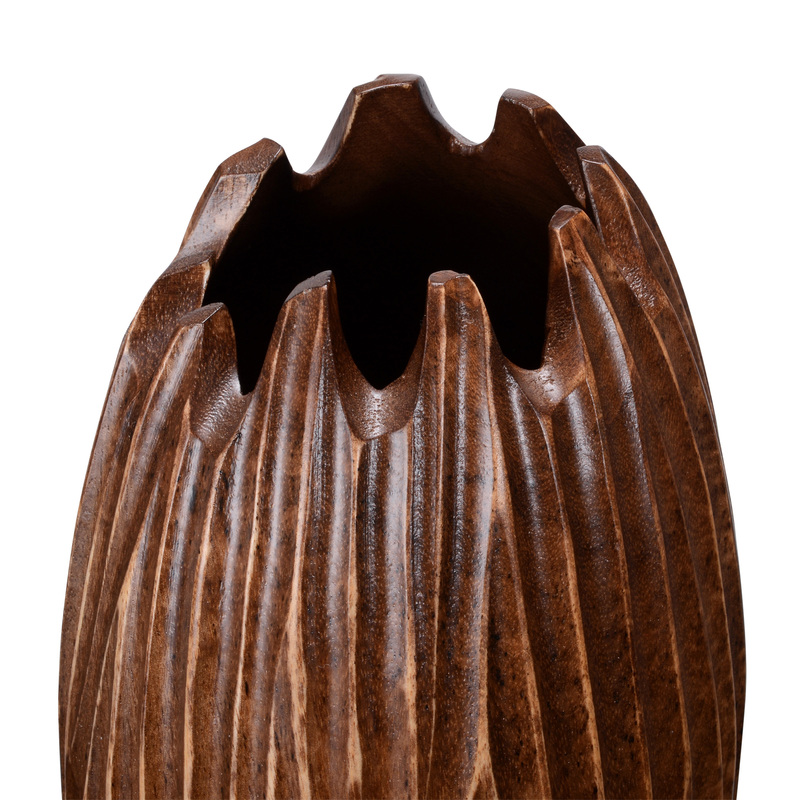 Each Villacera Handmade Mango Wood Vase is uniquely hand carved out of sustainable, durable mango hardwood, leaving minimal differences in the fresh, natural carvings of each piece. Eco-friendly mango wood is relatively hard and dense and therefore very durable, requiring little to no maintenance, providing any room in your home, an accent piece for years to come. Dimensions: (L) 6" x (H) 12" x (W) 6". Material: Mango wood. To clean, hand wash with damp cloth & towel dry. Do not let your mango wood item sit in water or remain wet for extended periods of time. SATISFACTION GUARANTEED: Villacera is committed to providing the consumer with the absolute best price and value on our entire line of products, which we ensure by applying a rigorous quality control process. 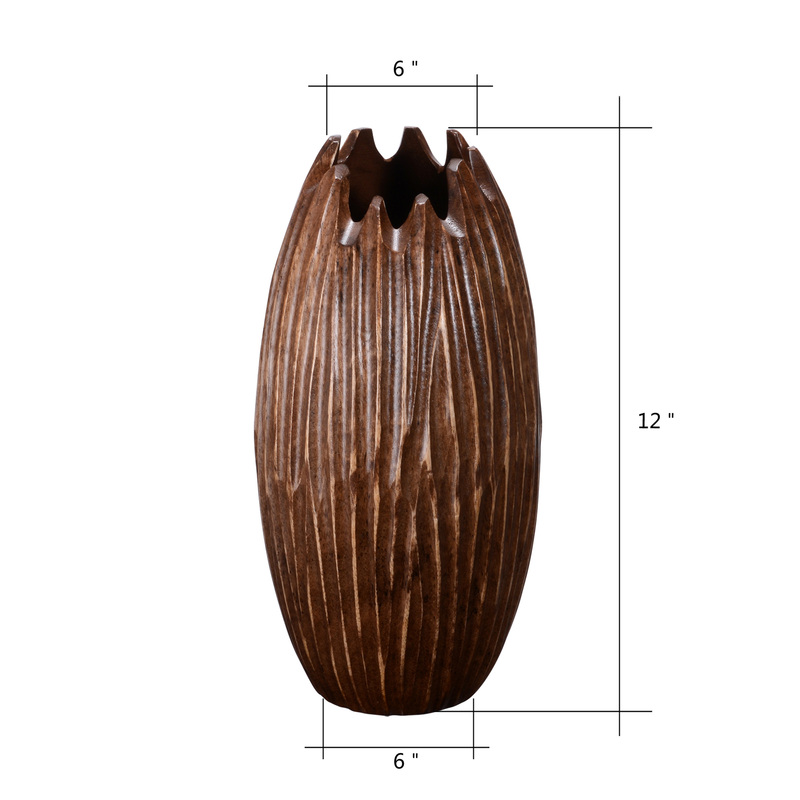 NOTE: This is an exclusive product of Villacera and Handmade 12" Tall Round Mango Wood Brown Tulip Vase by Villacera are GUARANTEED to be genuine. 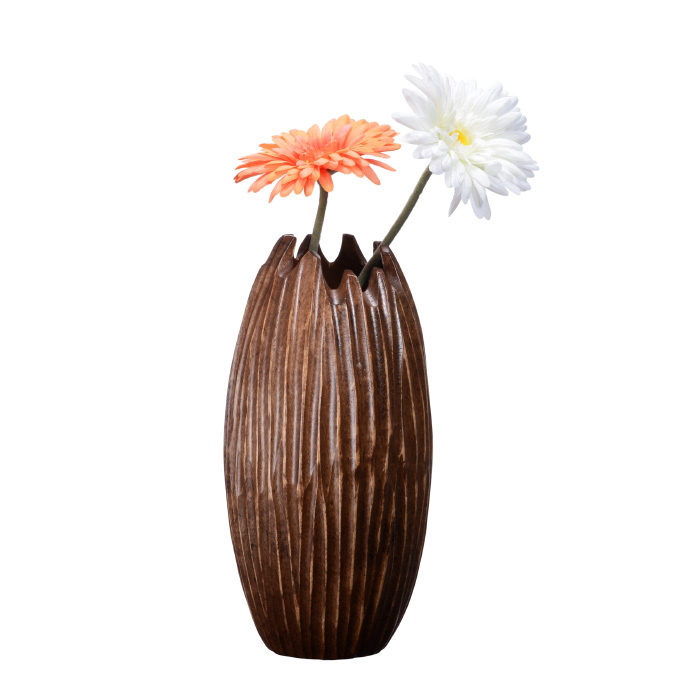 STYLISH ACCENT- This unique vase can stand alone home accent or set a pretty flower inside and place on a side table, atop a dresser or use as an accent piece in a bathroom. 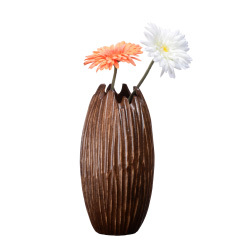 The possibilities are endless with this versatile vase! PRODUCT DETAILS- Dimensions: (L) 6" x (H) 12" x (W) 6". Material: Mango wood. To clean, hand wash with damp cloth & towel dry. Do not let your mango wood item sit in water or remain wet for extended periods of time.